Spa Time for Cedar Waxwings! I must have done something right on June 4 (2016). Oh, what joy when I saw a flock of at least eight cedar waxwings splash about in the stream just north of Laupot Bridge in Central Park! And even more joy when they came down to bathe, and I was able to catch their ablutions on video. This, my friends, is the kind of Silly Video I'm trying to make when I go out every day with my camera. I hope you have as much fun watching this as I had watching the waxwings. The music, which fits as perfectly as I could hope, is by Chopin. Just a little postscript: As I headed out of the park for Lincoln Center, the sky opened and I got soaked. I wasn't nearly as happy to be wet as the waxwings appeared to be. 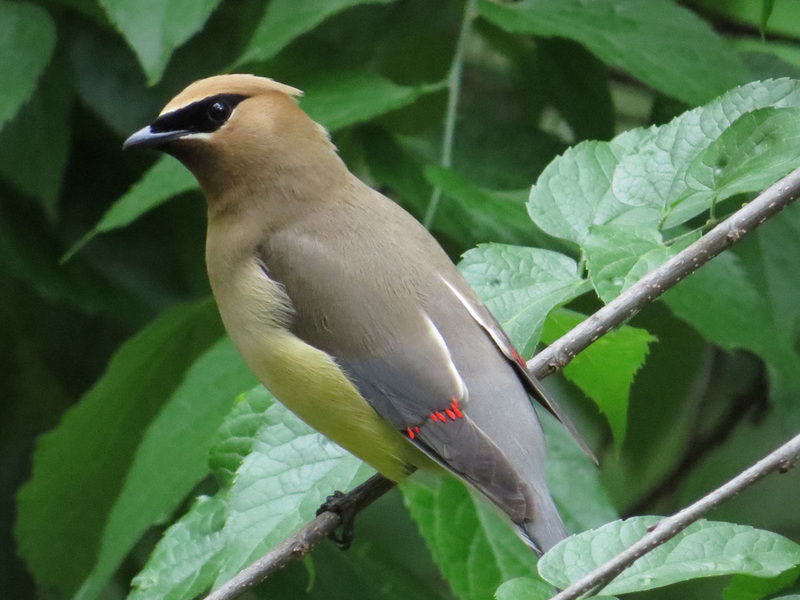 A Central Park friend calls cedar waxwings the drag queens of the bird world. They are certainly flamboyantly beautiful. I look forward to seeing them, and love watching them take a bath. These first shots are from July 1 and 2, 2015, at the stream north of Laupot Bridge.